Atelier Nostalgia | Nostalgic musings, on historical clothing, traditional costume, fantasy, photography and history. I was very excited when Shari from La Rose Soiree announced that she’d be holding a Victorian Fancy dress ball. It’s a very specific theme, but it also gives opportunity for some very fun costuming! I based my dress on fabric I already had, and it turned out to be a purple gold fairy. A short video of how it turned out! I had this purple gold shot silk organza in my closet already. Originally I planned to maybe make a fantasy type of francaise with it as it was a cheaper find, but that never really happened. So when this theme was announced, I figured it’d be perfect for it! 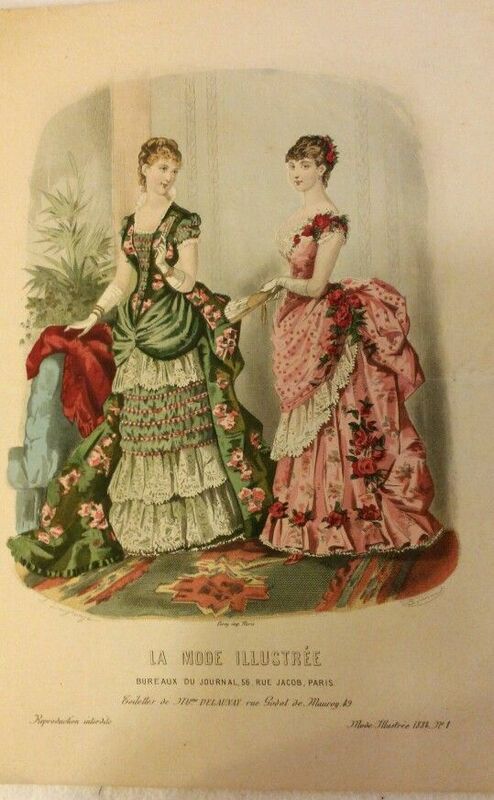 Colored organza is not really something you see a lot historically, but it does fit the fancy dress theme quite well. For the design, I started with looking at a lot of different plates for inspiration. I knew I wanted something flowery/fairy like, as that would fit the fabric best. I also knew I wanted a ‘short’ dress, as that’s so specific to fancy dress, and looks so fun! (It’s also great for dancing ;)! ) In the end, I settled on two main inspiration pictures. This was the main fairy inspiration. Although a different color, I like how this dress could very well have been made of organza as it has the same light feel to it. I also liked the fairy with flowers concept, and the length. The skirt design I wasn’t 100% sure about, so I did some more looking for dresses with flowers, and eventually settled on this pink dress as main inspiration for the skirt. I really like the pleats on the under skirt, and the flowers to the side of the drapery. With those ideas, I went to work! The very first step was deciding how to treat the sheerness of the organza, as it’s definitely see-through. I settled on lining it with cotton in a light blue color. The blue makes the purple a tad less bright, and a bit more lavender-like, which I preferred. I cut the lining as mock-up, and fitted it that way first. Then all the pieces were flat-lined, stitched together, and the darts were pinned through all layers on the body to get a smooth fit. For the base skirt, I cut the cotton following the basic 1880s underskirt from Truly Victorian. The organza layer was cut nearly twice as wide for the front and side pieces, to allow for the pleats in front. 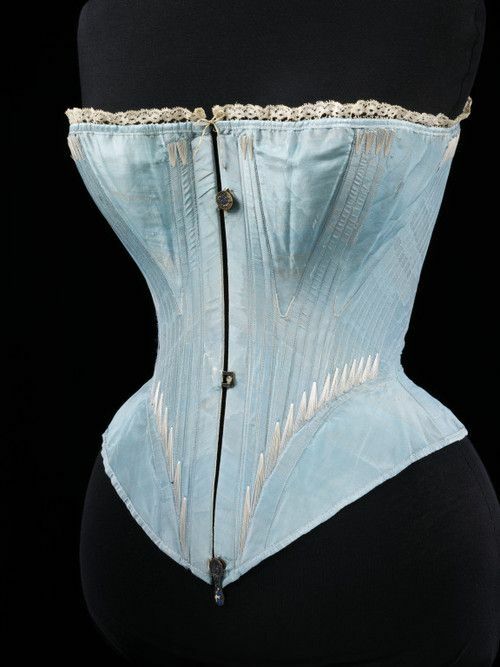 The organza was hemmed with french seams, and all the layers were caught at the top in the waistband. Fitting time! This is always the exciting stage where things start coming together. At this point, the center front is still pinned to do a final check of the bodice fit over the skirt, before it’s sewn shut. 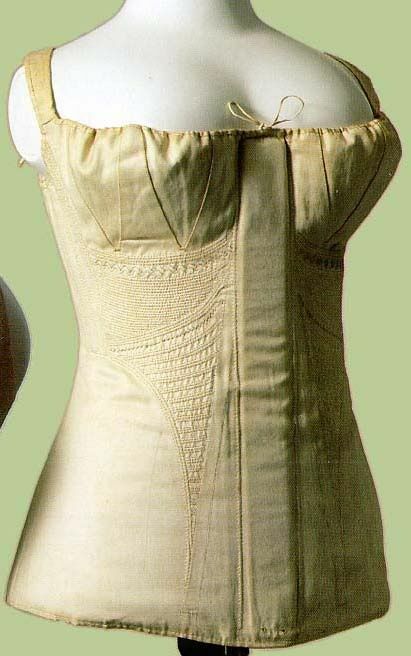 The bodice is boned center back, with eyelets to close it. I had a look, and saw both offset and parallel rows of eyelets (for spiral and criss-cross lacing respectively) on 1880s dresses, in the end I went with a parallel line. I worked the eyelets with silk machine thread doubled up, which worked quite nicely. The overskirt was based on Truly Victorian TV362, but shortened. In this picture it’s still un-hemmed. I already shortened it when cutting, but this shows that especially the apron needs further shortening still, to give room for flowers on the underskirt! The right picture shows the gathers at the top back of the underskirt. For the bodice decoration, I draped some pieces of organza on top until I liked the look. The skirt decoration is made of plastic flowers, as I didn’t really want to make flowers myself (nor had the time). I ordered a mix of gold and purple flowers, and spray painted them with white gold in various thickness to make them match with my fabric. On the underskirt, there’s two roses glued to one gold flower, then backed (first glued, than stitched) with felt, and then the whole thing is stitched on. For the side drapery, I used a purple garland and just twisted gold and purple flowers into it. The whole thing is attached to the side gathers of the overskirt on both sides. Final touches were the roses on the bodice and shoes, both which I backed with leafs originally attached to the gold flowers. The shoes are American Duchess Tissots, and the roses are sewn onto shoe clips to make them versatile! The sleeves were finished with some leafs as well, and I also had some leftover time to make wings! I based these on plates of Victorian ballet dancers, as I wanted a small shape which wouldn’t hinder any dancing. They are made of wire, with fabric glued on. The fabric is glued around the edge of the wire, and the raw edge was hidden with some glitter glue I found in an old crafting box. So that’s the whole look put together! It was such a fun project to work on, and the finished result is so whimsical it really makes me happy to just look at. It was also very comfortable to wear! The shorter skirt makes dancing a breeze, and I had to check myself when I didn’t even have to lift my skirt when going up the stairs. I definitely showed a lot of ankle, but fairies can be a bit scandalous, right? Every year early March, there’s an antique & textile market organized by the Dutch costume society. I always come home with some lovely things, and this year was no exception. So a little overview of what I got! I got two skirts and a sweater. The sweater is machine knitted and from Staphorst, where they wear this lovely color sweater with the traditional costume. Most these sweaters have a slight empire line, and I got one of those last year. 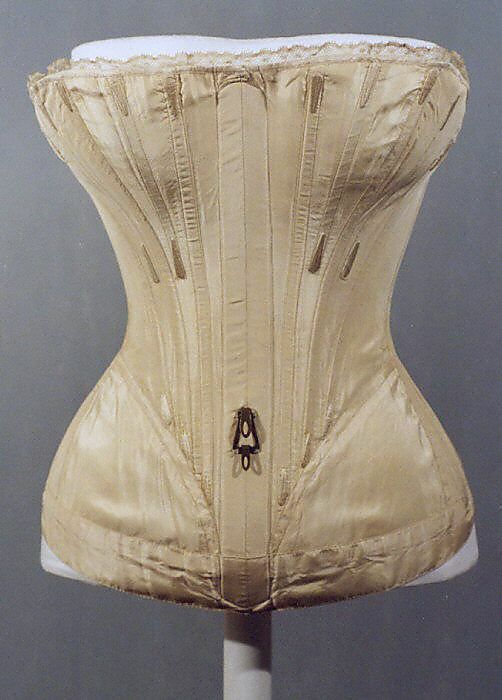 This one has a ‘regular’ waist line though, so it was a nice addition! The two skirts are both petticoats. The first is cotton, in this lovely textured fabric. It’s got a couple of stains, but nothing dramatic. It’s also quite a bit too wide for me, so I plan on removing the waistband, shortening it and then re-attaching the skirt fabric to make it fit. The second petticoat is this lovely striped wool one. It’s pretty much flat in the front with gathers in the back, and the hem is finished with a small cord. This one will be nice as extra winter petticoat underneath a lot of things! Then there’s the accessories! I found a couple of gorgeous wide collars, some chemisettes, undersleeves, a pocket and a skirt lifter. Perhaps my favourite find was this double collar with lapels at the front. 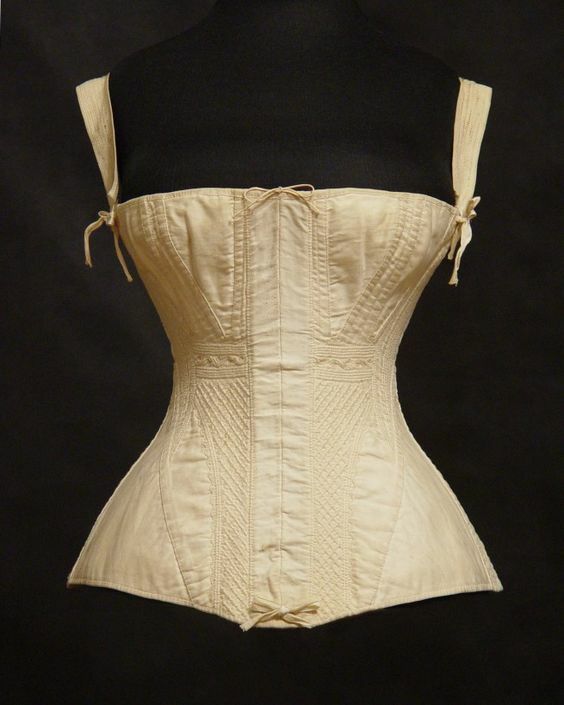 It’s of very thin white cotton, with beautiful white work. The other cotton collar is a little simpler in shape, but perhaps even prettier in fabric. Very sheer, with white work embroidery and lace. The third collar is a lace one of sheer embroidered tulle. The two chemisettes are both of very fine cotton. The first one has a checkered pattern woven in, the second one is a bit plainer. I think both will work both with regency and Victorian stuff. The undersleeves are also of fine cotton, with a small dot and lace around the cuff. Finally, I got a pocket and a plain skirt lifter. I have a rather crude pocket I made myself, and I’ve been saying for years that I should replace it. As I haven’t yet, this seemed like a good option. The skirt lifter is a very simple one and the rubber/felt is gone so it slips, but I can replace that. Always a handy thing to have! Finally, I also got some lace. I didn’t look for lace very actively as I already have a fair bit, but these two pieces I couldn’t resist. They’re both very wide, and pieces long enough to trim the full underside of a skirt. Many pieces are too small, which makes them much more difficult to use, so finding 3m or more is always special. The other piece is just a bit smaller, and 3m long. A week ago I finally got the chance to drop by the current fashion exhibition in the Gemeentemuseum in the Hangue. Named ‘Femmes Fatales’, it’s a tribute to female fashion designers. It was a lovely exhibition, with some beautiful pieces by both early 19th century (Chanel, Lanvin, etc) and 20th century female designers. However, I spent most time in the first room, which was dedicated to the 18th century female dressmakers, the marchandes de modes. There was a whole range of beautiful dresses on display, so I took the opportunity to take some pictures! The descriptions are the originals as provided by the museum. 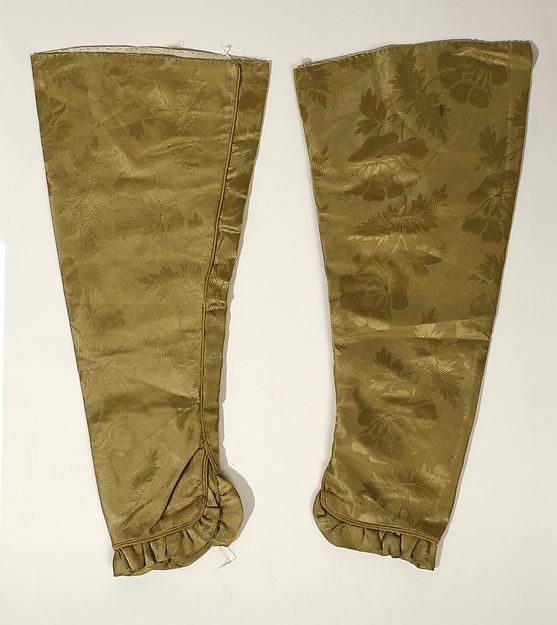 Over dress and skirt, (altered, skirt originally ca 1740-1760). Ca. 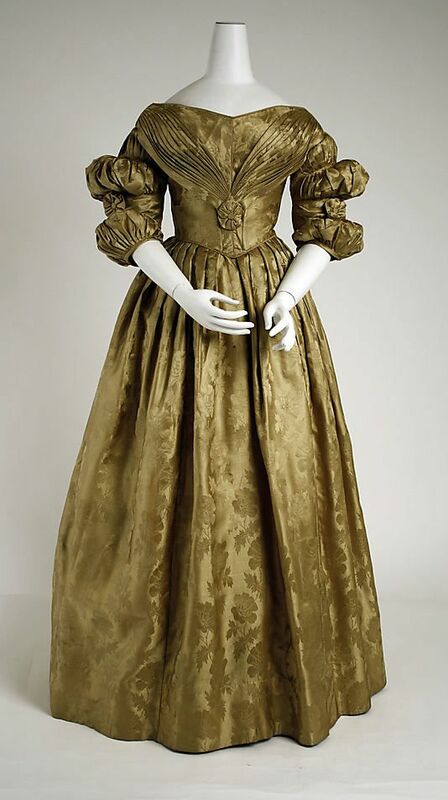 1780-1790, silk, linen, metal. About a week ago, we held another Victorian picnic, the 3rd already! That also made me realize I haven’t actually blogged about the second one either, so here’s a post making up for that! For a little background: about a year ago I got the idea that if I wanted more historical events, I could also organize something myself. I’d have to be fairly low-key though, as I didn’t actually have a lot of time to do so. So I settled on organizing a picnic, where everyone brings their own food. As we have a lot of Regency events here, but not so much Victorian, that became the theme, and we included the often forgotten 1830’s to get a time range of ca. 1830-1900. In august, we held the first picnic at de Haar castle. It’s so nice to see how the group has steadily grown, and to see people come back again for a second or third time. It’s also very inspiring to see all the beautiful costumes, and all days were lovely days out with lovely people. We’ll definitely be doing more of these come spring and summer! “But, what are we to wear? I was quite excited when Shari (from La Rose Soiree & La Rose Passementarie) announced that she would be holding a Victorian fancy dress ball. My first thought was excitement. The second thought is very well described by the quote above. This lovely booklet was pointed out to me by Desiree, and it’s such a treasure! It gives a thorough catalog of all types of options for fancy dress, including quite a lot of grey scale pictures, and a couple full color ones. It’s a lot of fun to read through as well! In this post, a small selection of some of the gems inside the book. The book starts with recommendations on what costumes to wear depending on your coloring and age. Brunettes could choose, for instance, Autumn, Diana, Fire or Spanish dress, while fair women are more suited to Day, Fairy, Moonlight, Rainbow or Swiss dress. Sisters could go together, and choose costumes such as Salt and Fresh water, Music and Paintings or Oranges and Lemons. Similarly, husband and wife could do Kings and Queens, or Night and Day. Then it’s on to the specific costumes! In alphabetical order, as they are in the book, a favourite for each letter. A: Aquarium: Fashionable evening dress of blue and green tulle, trimmed with marine plants and ornamented with fish and shells, the octopus on one side of the skirt; veil of green tulle; hair floating on shoulders. Bodice trimmed with seaweed and coral; ornaments, silver fish and coral. B: Butterfly: Short white satin skirt, covered with clouds of brown, pink and blue tulle. Flight of butterflies all over it. Wings of blue gauze, and the antennae in the head-dress. White silk stockings and white shoes. Butterfly on each. C: Chess: Front breadth, squares of black and white silk, black band at edge of skirt, row of red ribbon above. Black silk train piped with red, caught up with check ribbon, and bordered with checks. Sleeves of black and white squares to wrist, black cuffs piped with red. V-shaped black bodice, with ruff. Coronet of chessmen, larger pieces in front, the same for ornaments, all made of wood. D: Dresden China: Under this name almost any poudre character may be worn, with or without a saque. It is generally thus rendered: Quilted short skirt, high-heeled shoes and clocked stockings; chintz or brocaded bunched up tunic; muslin apron; low bodice; short sleeves with ruffles; coloured stomacher laced across; bow of ribbon or black velvet around neck; straw hat or muslin cap; powdered hair. A newer rendering has bows of ribbons and flowers on the shoulders, with a tiny china figure in the centre; a satin chapeau bras with mroe flowers springing from centre; crook and high-heeled shoes. E: Eve: Dress of white India muslin, trimmed with apples, leaves and blossom; fig-leaves for pockets; out of one peeps a serpent’s head with emerald eyes, out of the other falls a triplet of white lilies; a wreath of small apples, flowers and leaves, necklace, a serpent of gold and silver enamel in red and blue. F: Fairy: Short tulle diaphanous dress, with low full bodice, covered with silver spangles; silver belt at waist; wings of gauze on wire attached to back; hair floating; a silver circlet on the head. Or, for a Fairy queen; a crown, the wand, to be carried in hand, becoming a sceptre. Stars should be introduced on the dress and on the satin shoes. G: the Gloaming: Dress of grey tulle, or muslin, or gauze over satin, made as an ordinary evening dress, or in classic fashion; a veil of the same material; fireflies imprisoned int he tulle; bat fastened on one shoulder, an owl on the other; silver and smoked pearl ornaments. I: Ice maiden: White gauze dress; pointed tulle cap and veil fastened with wreath of icicles or ice-flowers spangled with powdered glass; long gloves; bracelets and chains of icicles; girdle of falling icicles made of glass. L: Lorelei: Dress of watered silk, shot with silver, draped with green, and caught up with water lilies, coral and diamonds; veil to match; sometimes soft muslin is draped in classic fashion; the hair flowing; a coronet of silver on the head; an old fashioned lyre carried in the hand. M: Magpie. 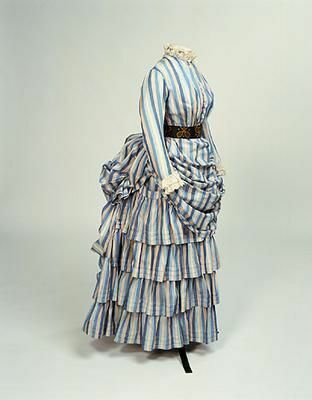 The front of skirt is striped black and white satin plaited; the bodice cut in one with long side revers of black, lined and turned back with white ruching to the hem of the skirt, opening down back to show full plaited skirt. The black bodice bordered with white; low striped vest; magpie on the shoulder and in hair; which may be powdered or not, or half powdered. N: Needles and pins: This dress is after the mother Hubbard order. A quilted skirt, with chintz train; low black velvet bodice, fichu; powdered hair; cap and pointed velvet hat. In front of the dress every kind of needle and pin is inserted. Pins forming the motto “Needles and pins, needles and pins; when a man marries his troubles begin,” on the train. P: Planets: White satin short skirt, bordered with a blue silk band and dotted with silver stars; white gauze over-skirt and plaited low bodice bespangled with stars; long wing-like sleeves to match; blue satin Swiss belt cut in points, a star on each; blue coronet with stars; long veil with stars; necklace and bracelets of the same. Q: Quicksilver. Fashionable black evening dress made of tulle, and trimmed with silver. S: Sunbeam: White tulle dress, flounced to waist, each flounce edged with rows of gold braid; a large sash round the waist with gold fringe, a gold chatelaine bag at side; head-dress, veil of gold tissue, enveloping the figure and glittering at every moment; ornament, gold. T: Twenty-four o’clock: New clock dial on chest and forehead, with hours from one to twenty-four; at back of head a pendulum swinging; short costume of black and white satin. U: Universe: Short blue and white dress made of cashmere or soft silk in classic fashion, or in gauze or twill as an evening gown, with stars and spheres for ornaments; star-spangled veil. Y: New Year: Radiant young girl in heyday of youth wearing plain long full satin skirt, with hours in silver round it; silver cord about waist; bodice full; pendent sleeves from elbow, caught up with roses; wreath of roses and veil in hair. With looking back, there’s also time to plan new things! As per usual, my plans mostly focus on the first half of the year, and are centered around events. 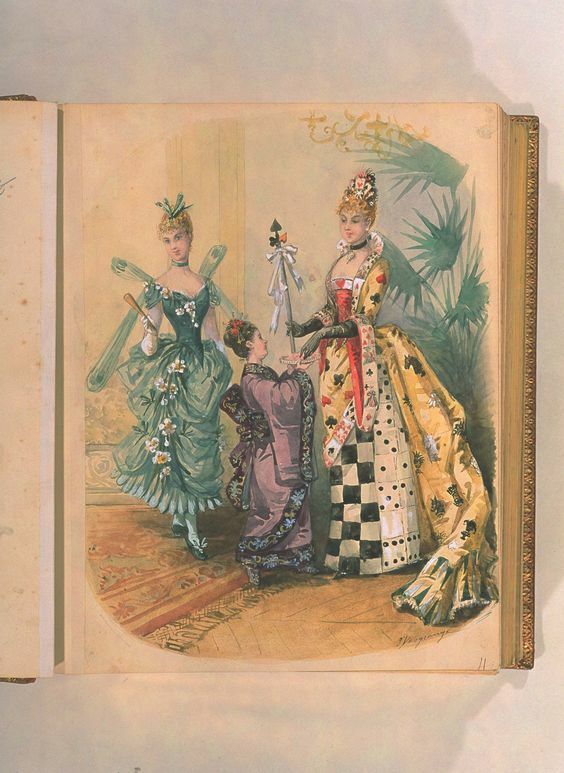 First up is the new-years ball, with theme 1830-1860. I figured that this would be a perfect excuse to finally make that 1830’s dress I wanted to make. The dress is mostly done now (which is good, as the ball is in a week). I do need to add some finishing touches, first priority is to get it wearable for the ball! (No tacked down allowances needed for that 😉 ). After that, I’ll start sewing for a Victorian Fancy dress ball in April. I really love the idea of this ball, and my idea for a dress is mostly based on what I have in my stash. I have a purple/gold changeant silk organza, which is very lovely, but also very purple, and not very period looking. It’d be perfect for fancy dress though. I love the shorter skirts you sometimes see in fancy dress costumes, and I’ll be going for an 1880s look. Probably some fairy/queen type of thing, hopefully with gold flowers all over. The lady on the left is one of my inspirations. I might make a change or two to the drapery etc, but the silhouette and flowers is what I’m going for. I have one more event planned so far, which is a Regency ball, but I’ll probably re-wear my red/white dress, or my blue/silver one for that. The final plan I have is related to the Victorian picnics I’ve been organizing. It’s a pretty low-key event, but a lot of fun and good excuse to dress up. I found out last summer though, that all of my victorian costumes are either silk, velvet, or wool. Not the best for hot summer weather. 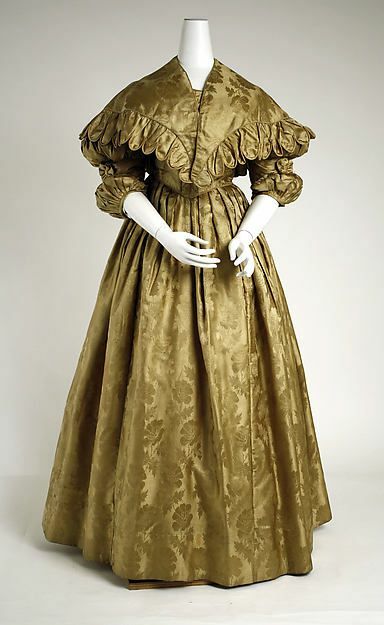 So I really want to make a cotton bustle dress, and I have my eye on the tennis style dresses you see in the 1880s. I love this one, it’s relatively simple, yet a lot of fun. For the second half of the year, it’ll depend on events again what my plans will be! The new year has started, so it’s time to look back at 2018! I had few concrete historical costuming plans at the start of this year, mostly planning underwear and accessories. Those plans were the 1660s shift, 18th century stays, and the steeple henin. Those all got done, so that’s good! I didn’t do so well with my modern wardrobe, as I planned to make 2 dresses, but only got half-way on one. Looking back at what I did make, it’s mostly underwear and accessories. I made two shifts, one pair of stays, one corset, one false rump, one corded petticoat, three 18th century petticoats, a fichu, a hat, and a henin. Top-Bottom, Left-Rithg: 1660s shift, Burgundian henin, 18th centuy stays, false bum, petticoat, fabric for other 2 petticoats, hat, 1830s corded petticoat & early victorian corset. I don’t have ‘separate’ pictures of the 18th century shift and fichu. For outer garments, I only really finished one piece; my 1780s silver dress. But honestly, given that it was sewn all by hand, and how busy last year has been, I’m pretty happy with it. It wasn’t rushed, and I didn’t take short cuts, which usually lead to regrets. It took me half a year to sew, but I really enjoyed making and wearing it. That definitely makes it worth it, although I’m not yet planning to make everything entirely by hand in the future. I’m also really happy with how the whole look came together. I made quite a bit of underwear and accessories for this dress, and for my first attempt at the 18th century, I think it came together quite well! However, when thinking about this year, what really comes to mind is not the costumes I made, but the events I went to. In 2017, I visited one historical ball, and that was only the second one ever. I’d mostly been wearing my costumes to fantasy fairs. I did that in 2018 as well, but I also visited four historical balls, one salon, organized two historical picnics, and went to a conference. This was one of my big goals, and I’m so happy it worked out so well, as all of these were wonderful experiences. The events from last year! Top-bottom, Left-right: Winterball at D’Ursel, Salon de societe de raffinee, victorian picnic 2, Structuring Fashion conference, victorian picnic 1, Societa di Danza ball Brussels, Persuasion ball, Elfia fair, New-years ball Ghent. A big bonus of visiting more events was that I got to know more people in the historical costuming scene, or got to know them better, which was so lovely. So thanks to everyone for making it a great year!